You’ve seen them. Souvenir replicas of grouping of city buildings made together on one base. The skylines or cityscapes are usually not an accurate depiction nor to scale, but rather a compilation of famous buildings in that metropolis. New York City must have the top the list of most different types of cityscapes. The pot-metal, made-in-Japan, souvenirs from the 1960’s are not hard to find (see photo above). However, when you look closely, you’ll notice small variations in either the base or which buildings are represented. The Empire State Building and Statue of Liberty are omnipresent in these, but sometimes you’ll see a bridge, the U.N. or Rockefeller Center. Larger cities usually have skyline souvenirs – Chicago, Paris, D.C., Boston, Baltimore, Toronto, and Quebec – while others are surprising like St. Louis and Plymouth, Mass. Any city with a large tourist draw may have them. 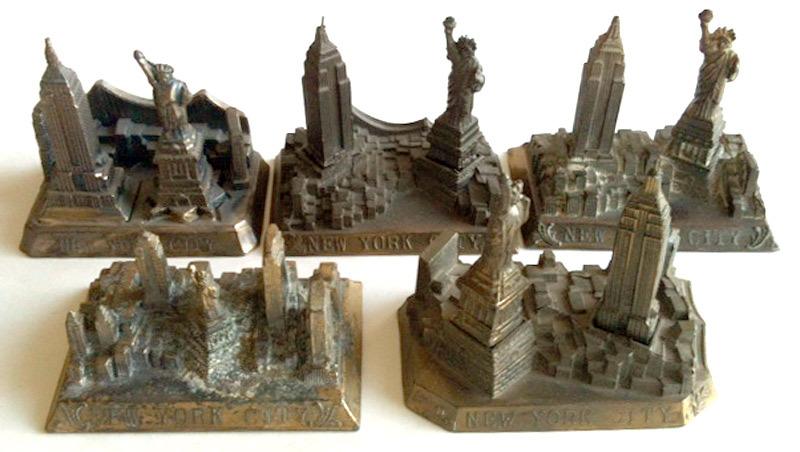 Some are older like the large and detailed replica of NYC, Paris and D.C., while others are more recently made and usually produced in pewter.